Finding a great deal on a Miniature Horse Bit can be difficult. But do not worry as we have a vast selection of Mini Horse Bit items that are not just made of superb quality but also affordable. 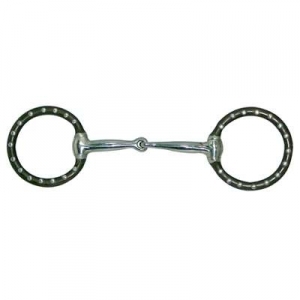 This Mini Horse Ring Snaffle Bit is a great bit for mini horses and has antiquated bit and stainless steel dots. The jointed bit creates a snapping action in the mouth with the rings and mouthpiece working in concert. These Bits measure 2.5'' in the rings and 20mm mouth. Get your Miniature Horse some Bits today at Horse Tack Now, Your number one source for Mini Horse Tack products.